I’m writing this one down so that I don’t forget it because I’ve done it multiple times and I forget it every time and it’s one of those topics that I can’t find particularly well documented on the web. 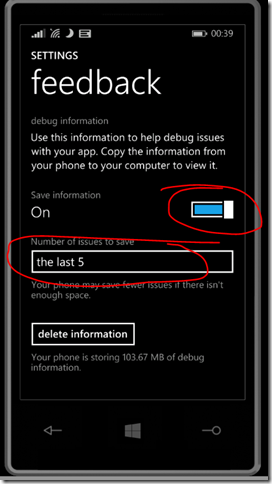 Imagine you’re testing out a Windows/Phone app on a device where it’s crashing but you can’t easily debug it. Perhaps it’s not your device. Now, on the one hand, the Store can help with this ( as per this post ) but that’s not much help if the app isn’t in Store. 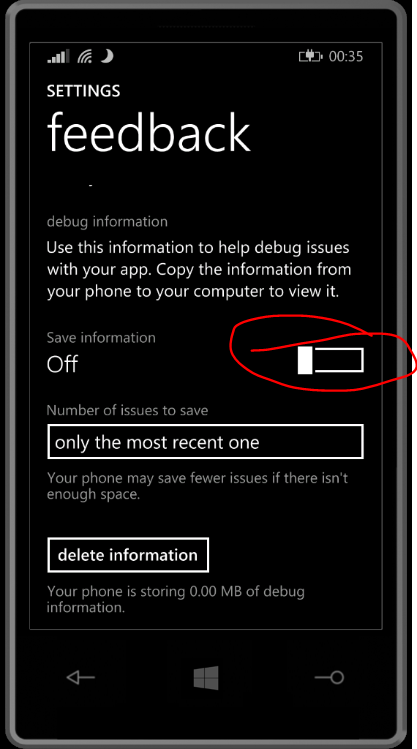 Fortunately, both Windows and Phone help you with this. 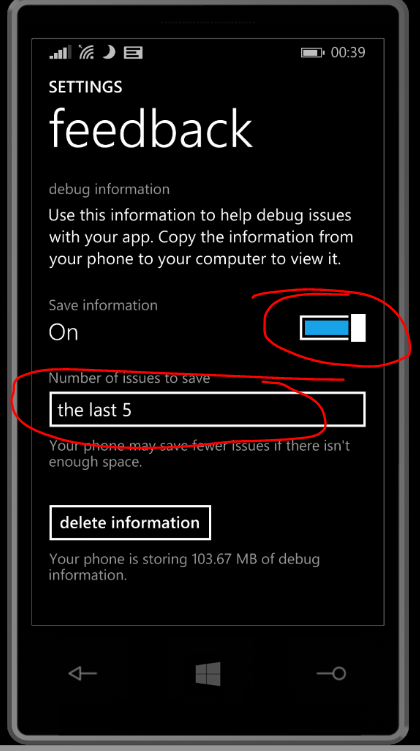 I think the Windows behaviour has been there for a long time and I think the Phone behaviour is specific to V8.1 but I haven’t checked that in any great detail. Here’s how to get it going. 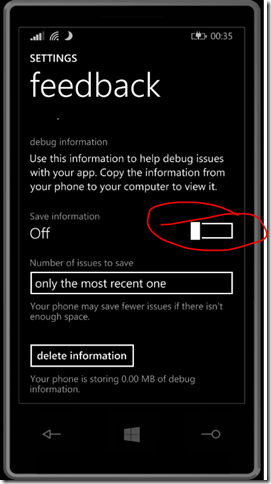 If you have a crashing application on Windows Phone 8.1 then it will write a crash dump to a specific location on the Phone if the settings are right. As far as I can tell, that will happen with a “vanilla” app fresh out of the Visual Studio templates whether it is built as a debug app or as a released app. and so I can now take those dump files off the phone, load them into a debugger and maybe do something with them. which is a smaller number of settings which, again, as far as I know can be done globally via HKEY_LOCAL_MACHINE and at a user level via HKEY_CURRENT_USER and I believe that they can also be done for an app. At the time of writing, I have to confess that I’ve never had a tonne of success in configuring these settings the way I’d like for a Windows Store app in that I’ve never managed to configure settings specific to one app, I’ve always had to rely on the wider settings working for me. I can’t give you the exact combination of all these settings that is going to work in your environment but I can say what has worked for me. so, clearly, the Windows App Cert Kit is on my machine and has set itself up a folder and it has set it up at HKEY_LOCAL_MACHINE so, effectively, it’s tried to be make a global setting. and I have no key called HKEY_CURRENT_USER\Software\Microsoft\Windows\Windows Error Reporting\LocalDumps. 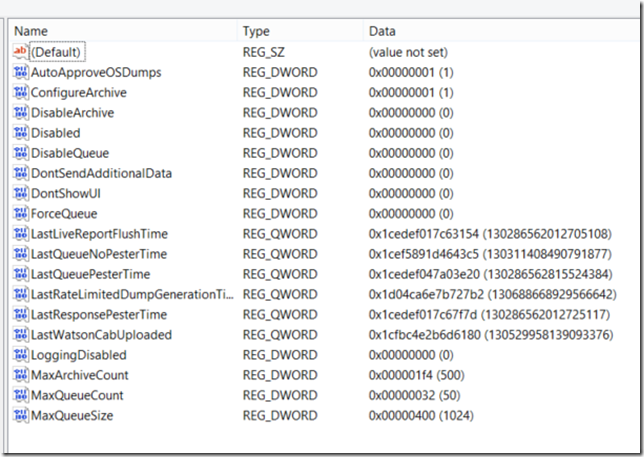 Again, I haven’t done anything to set up these values so they are more than likely close to the defaults where they are settings rather than stored state values for WER. and, once again, I can now move that to a debugger for analysis.